The bail bond industry is much more dynamic than just helping people get out of jail following an arrest. There are other key services provided by expert bail bond agencies that can assist with certain legal situations. One of those services is the issuance of a non-arrest bail bond. This is a special type of bond that is only applicable under certain circumstances. Here is how a non-arrest bail bond works. In most scenarios in which a non-arrest bail bond is going to be used it means that the defendant was previously arrested and charged with a crime. They would have likely been bailed out following that arrest and were awaiting court. If a person is out on bail and misses court there is probably one of two things happening. One, the person skipped bail and is on the run, knowing they will end up in jail following their trial period. The second is that the defendant genuinely forgot or could otherwise not make it to court when they were required to be there. 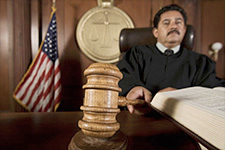 If a person misses court a warrant will usually be issued for their arrest, returning them to jail. However, if the suspect is proactive in their conduct they may be able to avoid being returned to jail. The suspect should approach the bail agency that got them out the first time and ask for a non-arrest bail bond. This allows them to post their bond before being taken back to jail, generally allowing them to skip booking and other parts of the process that are not much fun for anyone. If you have missed a court date and would like to turn yourself in using a non-arrest bail bond in Kelseyville, Yuba City or elsewhere in Northern California reach out to Rob Brown Bail Bonds. We can help you with all of your bail bond needs. To learn more or to begin the California bail bond process give us a call at (707) 587-4563 any time, day or night.